When we think about beautiful early spring flowers, most people think tulips. Tulips are by far the most popular of the spring blooming bulbs. You can find them growing almost everywhere. Most homeowners plant anywhere from a couple bulbs, to dozens or even hundreds of flower bulbs. Planted it the Fall, the result is a profusion of colorful, spring blooms, to help wash away memories of a long, drab, gray winter. Tulips are easy to grow, making them popular with virtually everyone. 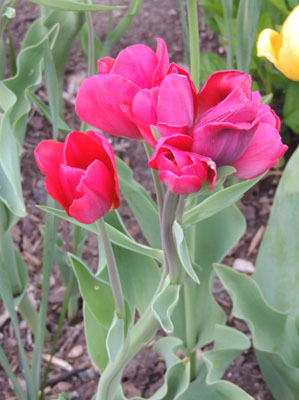 There are early, mid, and late blooming varieties of tulips. Make sure you consider this when planting your bulbs. You do want a continuous bloom in the spring, don't you!? Tulips come in a huge variety of bright colors, including white, yellow, pink, red, black, purple , orange, bi-colors, and more. There are many mixed colors to select from, too. Avid tulip growers create a work of art in planting the tulip bed. Some tulip beds are truely a masterpiece, limited only by your imagination. Tulips are native to Central Asia and Turkey. In the 16th Century they were brought to Holland from Turkey, and quickly became popular. They became so wildly popular, that "Tulipmania" occurred in Holland in the 17th century. People traded tulip bulbs for literally a fortune. Today Dutch bulbs, including tulips and daffodils, are exported around the world. They are grown in Holland in huge fields. Tulips are very easy to grow. The planning stage is a lot of fun. Many people will design an artistic, colorful layout for the blooms. It's a chance to express yourself. Select the location to plant your tulip bulbs. Prepare the soil by working it well, removing rocks, and weeds. Mix in plenty of organic material and fertilizer. Special bulb formulas and bone meal work best. (Note: however, tulips are very forgiving). They will bloom in almost any soil, almost anywhere. The only place where growing them will be a problem is in wet soil, as the bulbs can rot. When buying bulbs, select only the finest quality bulbs. Buying "cheap" tulip bulbs often results in inferior blooms. In general the bigger the bulb, the bigger the bloom. There are early, mid, and late blooming varieties. Keep this in mind as you plan and purchase your bulbs. If you buy tulips bulbs early, the bulbs should be stored in a cool, well ventilated area. Do not store them in a hot garage, as they will dry out. Many inexperienced gardeners have pulled up bulbs, and kept them in the garage until fall planting, only to find, dried up bulbs a few months later. Plant the bulbs any time in the fall. As long as you can dig a hole to put them in the ground, it's not too late. Follow the directions from the supplier for spacing and depth. If no directions were included, plant the bulbs 6-8" apart, and at a depth twice the diameter of the bulb. After blooming, let the plant continue growing, until it dies off naturally. During this post bloom period, the plant is sending energy to the bulb to store for use next spring. Tulips can be forced to bloom indoors winter months. Put a few bulbs in a flower pot. The pot is then "chilled" or set in the cold for a several weeks. This tricks the bulbs into growing after being brought indoors in a warm environment. Place it in a suny window and in a few weeks you will have Tulips blooming in the middle of winter..